Tuesday, October 4, 1870 – Report of commissioners filed. v. 2 p. 263 to 265. 1st: in the year 1834 there were two tracts of unclaimed lands, the Quien Sabe and Santa Ana, unlimited in quantity. That the plaintiffs as among themselves are seized in fee of said one undivided 1/2 part of all of said premises and hold the same according to their respective rights and interests therein but which rights and interests as between them are not now determined. That the said Defendants as among themselves are seized in fee of the one undivided half &c &c.
That commissioners should be appointed to make partition; that such commissioners should, if the same can be equitably done, set apart to Plaintiffs' and Defendant's lands embracing their respective improvements; let an interlocutory decree be drawn accordingly. s, S. B. McKee, District Judge. 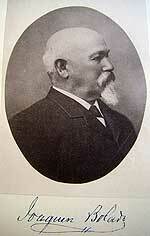 NOTE: Samuel Bell McKee served as a Justice of the California Supreme Court from 1880 – 1887. Wednesday, August 4, 1869: Suit: answers to cross complaint filed. That so much of plaintiff's (Joaquin Bolado & José G. Arques) prayer seeks to obtain decree of this court declaring the pretended partition a good and valid partition; or declaring plaintiffs to be exclusive owners of that part of the lands called Santa Ana; or as seems to establish the pretended dividing line set up in plaintiff's complaints, or compelling these defendants to make conveyances and assurances of title to plaintiffs to be denied. MacDougall requests court to decree that MacDougall has an undivided 12th of lands granted by letters patent, and the said defendants Juan Francisco Anzar, Anatolio Anzar & Policronio Anzar each own 5 undivided 36ths; and said plaintiffs as among themselves to be the owners of one undivided half part thereof, and that the land be divided in an equitable and just manner. Horace Hawes sued Anzar et. al. 10/5/1868 in Monterey’s 3rd Judicial District Court alleging Juan Miguel Anzar made contract with William Carey Jones 6/20/1851, that Horace Hawes bought; the court awarded Horace Hawes the undivided 1/10th of Rancho Quien Sabe. v.2 p.224 – said Rancho Quien Sabe contained 5 square leagues of land, more or less. 1868-10-05: Horace Hawes sued Anzar Heirs claiming Anzar sold 1/10th of Rancho Quien Sabe to WC Jones which Hawes Bought. Horace Hawes sued Frederick A. MacDougall et. al. (Juan Miguel Anzar heirs) in Monterey County’s 3rd Judicial District Court alleging Anzar made contract with William Carey Jones 6/20/1851, that Horace Hawes bought; the court awarded Hawes 1/10th of Rancho Quien Sabe. Tuesday, May 1, 1860 – President James Buchanan in Washington issues United States patent for the Rancho Santa Ana y Quien Sabe grant. The patent was issued for the combined ranch — and it described its boundaries — to Manuel Larios et. al (including the heirs of Juan Miguel Anzar: Frederick A. MacDougall, Anatolio Anzar, Juan Francisco Anzar and Policronio Anzar). The grant was originally issued Monday, April 8, 1839 by Governor of Alta California Juan B. Alvarado to claimants Manuel Larios and Juan Miguel Anzar. California State Map ID number: MC 4:4-574 Grant number: 237. Book A Patents p 55-62. NOTE FROM THE BOLADO/ARQUES SUIT, V2 P. 253: THAT THE LANDS GRANTED INCLUDE ONLY A PART OF THE LANDS PETITIONED FOR, AND A PART ONLY OF THAT DESCRIBED IN THE DECREE OF THE DISTRICT COURT. Abstract v.2 p 209, 211. Wednesday, April 9, 1856: Anzar estate: Order settling account of guardian for 1st year of guardianship of Anatolio Anzar. Shows a cash balance of $12,859.97 in hands of guardian, less $419.07 to be paid out of said balance. A prob min p. 327. Anzar estate: petition of guardian MacDougall to sell personal property. Saturday, November 24, 1855: Anzar estate: report and application of Frederick A. MacDougall, guardian of Maria Barbara Anzar filed; and accounts of guardians of the 3 other heirs: Juan Francisco Anzar, Policronio de Guadelupe Anzar and Anatolio Anzar. Wednesday, May 30, 1855 – Maria Antonia Castro de Anzar de MacDougall died intestate in San Juan. She died after inheriting 1/2 of the undivided Rancho Santa Ana y Quien Sabe from her husband, Juan Miguel Anzar, who died October 29th, 1852. Maria Antonia Castro de Anzar de MacDougall died owning 1/2 (3/6ths) of Rancho Quien Sabe; the other half was owned by her 3 children. Each minor receives 1/3 of 2/3 of her 1/2 share; which is an additional 1/9th of Rancho Quien Sabe. Bolado/Arques suit, v2 p. 252. Saturday, May 5, 1855: Anzar estate: report of sale filed – order allowance for support of minor heirs. 1855-02-27: Anzar estate: petition and orders of sale of personal property. Tuesday, February 27, 1855: Anzar estate: petition and orders of sale of personal property. Anzar estate: Inventory and appraisment of estate of filed. Each 1/6th is worth ($1,666.66) per appraisers Johnson & Harris, verified by MacDougall. To the minor heirs each one undivided one sixth – to be held in common until partition by metes and bounds. Friday, December 22, 1854: Anzar estate – Affadavit of publication of notice to creditors of estate of Juan Miguel Anzar filed. San Francisco Times and Transcript newspaper published notice 5/30/1853 to 6/30/1853; printed notice attached. Wednesday, November 8, 1854: Anzar estate: final account of Juan Miguel Anzar estate executor filed. Petition for settlement of final account filed. Notice of hearing and certificate of posting filed. The joint Larios/Anzar claim (Rancho Santa Ana y Quien Sabe) was bounded: commencing at the northwest corner of a place called El Lomito del Corral Viejo (lomito means little hill) and running thence easterly towards the Cañada (gorge) des Pecachos in the line of the place called San Joaquin (Later entries say Rancho San Felipe; Abstact v.2 p.240) to the base of the range of the mountain called Quien Sabe, thence along the base of said mountains southerly to the Arroyo de Joaquin Soto, thence down said arroyo to its junction with the stream called Arroyo del Puerto del Rosario. Thence down said stream to a crossing of wagon Road to San Juan and thence by a place called Loma de en Media (?) to the place of beginning. Appeal was made to the District Court of the US in the Southern District, it was pending and undecided until 12/12/1856. Tuesday, July 25, 1854 – Frederick A. MacDougall married Maria Antonia Castro de Anzar, wife of the deceased Juan Miguel Anzar, owner of Rancho Quien Sabe. (MacDougall later inherited 1/3 of her 1/2 share which is 1 undivided 6th of Quien Sabe. NOTE: But according to later court decisions, Quien Sabe hadn't been separated from Rancho Santa Ana. Monday, July 24, 1854: Anzar estate – report of commissioners on distribution of personal property filed. A probate min. p. 166. Petition of Frederick A. MacDougall to have the amount of his bonds reduced. Wednesday, July 12, 1854: Anzar estate – Frederick A. MacDougall filed bonds for each minor: Anatolio Anzar, Maria Barbara Anzar, Policronio de Guadelupe Anzar, Juan Francisco Anzar. All approved the same day. Anzar estate: resignation of Maria Antonio Castro de Anzar to be accepted providing the court appoints Frederick A. MacDougall in her place. Notice of application and resignation filed. Order appointing MacDougall executor and guardian of minor children. June 15, 1854: Anzar estate – MacDougall petitions court — based on the desire of Maria Castro de Anzar to resign as administrator — to appoint him as administrator and guardian of Maria and Juan Miguel Anzar's children. Wednesday, February 16, 1853: Special term of Monterey County Probate Court for will of JM Anzar. Libr B of Wills, p. 13.
Letters testimentary issued to Jose Antonio Anzar and Maria Antonia Castro de Anzar according to the petition & without bond. Letters of guardianship of Juan Francisco Anzar, Anatolio and Policronio de Guadalupe heirs, and Maria Barbara, the adopted child of said Juan Miguel Anzar. Order appointing appraisers; Ja (sic) MacDougall, Kodoro (sic) (Teodoro) Castellano and Estebano de la Torre.